Hot oatmeal doesn’t appeal on muggy summer mornings. Looks like this is the time for dry cereal (or what some folks call cold cereal). Even the simplest flakes or o’s aren’t very appealing when we read the label’s nutritional details, knowing they leave us feeling hungry in a couple of hours. I’d like to recommend enhancing dry cereal, with sprinklings of nuts, berries or diced fruits and the good crunch of granola. Here’s a sound summer breakfast that will carry you though the morning. Most of us don’t realize that granola, almost as common today as corn flakes, grew out of a nineteenth century religious fervor for healthy living, to prepare for The Rapture. Sylvester Graham, Presbyterian minister, promoted graham flour, a stone-ground whole-wheat flour (hence graham crackers). James C. Jackson, founder of The Home on the Hill water cure spa and a Seventh Day Adventist advocating vegetarianism, baked the moistened graham flour in sheets, ground it into granules and suggested this granula as a new breakfast food. John Harvey Kellogg, also an Adventist and sanitarium director, copied the granula, got into a lawsuit, and named his version granola. Charles W. Post copied Kellogg’s cereal but named his Grape Nuts. Even my grandmother’s Dunker Brethren Inglenook cookbook published in 1915 has a graham flour recipe for Granula. Granola then faded into the wings until the hippie movement of the 1960s dusted it off, substituted oats for the graham flour, and the product became a wild success. 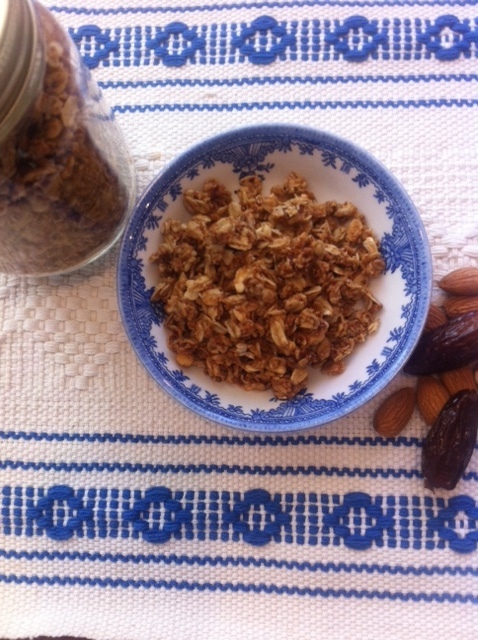 The granola recipe I keep going back to is one from the 60s. I came to it through a circle of Quaker friends who cooked with whole grains. It’s sweetened with a puree of dates and brown sugar. Brown sugar doesn’t burn as fast as honey used in most recipes, so this granola easily bakes slowly into crisp clumps, making it perfect to eat out of hand as well as to sprinkle on cereals, fruit or yogurt. It toasts best in a low oven over a period of a few hours, but it doesn’t demand a lot of stirring. It can be half cooked one day and finished off the next. Basically it’s foolproof unless you forget it’s in your oven. During a rainy weekend or a quiet evening, a low oven won’t pump out much heat, and the tantalizing aroma of toasting granola will waft through the whole house. Airtight in glass jars, granola will keep for weeks. Press the dates into a glass measure and add just enough water to barely cover. Soak overnight or microwave briefly until dates are softened. Combine dates, soaking water, brown sugar, oil and vanilla in food processor. Blitz to make a thick puree. Preheat oven to 250°. Combine oats, wheat germ and/or ground flax, coconut, almonds, and salt in a large mixing bowl. Pour over the date puree. Scrape the processor clean and mix the puree into the oats with your hands, coating all dry ingredients with the puree. Divide the mix between two rimmed baking sheets, patting it out evenly and scrape your hands clean. Bake the granola for an hour, stirring every half hour; then reduce the heat to 200 and continue to bake 3-4 hours or until the granola reaches the desired toastiness. Turn off oven and allow to cool in the oven. Granola will crisp as it cools. Store air tight. Makes 4 lbs. So what are we going to do with this yogurt to turn it into a classic sauce? During the cool, damp spring, mint grows in such profusion I have to keep pulling it up, or it will take over the entire garden. So: gather a hefty handful of mint. If you have no garden mint, look for it in the farmers’ market, grocery store—or substitute parsley. We’re ready to spend ten minutes turning this lovely green herb into a classic Indian sauce. Raitas, made from all sorts of vegetables, herbs and fruits combined with yogurt, accompany spicy Indian foods, and add zest to almost any table. The green herb part of this raita is best prepared with a mortar and pestle, but if you don’t mind cleaning all the parts, you can also use a food processor. I’m sticking with the mortar, which gives a better result, since the herb meets no heat from a motor. The mortar can also double as a serving bowl. I’ll need a little garlic, salt and a sliver of chili to liven up my green mash, and I’ll dust a bit of ground cumin over the top for a finish. Ready, set, grind. Slice the peeled garlic into the mortar; sprinkle with a pinch of salt. Add chili and grind to a paste. Gather mint leaves into a bundle on cutting board and slice with chopping knife. Add mint to the mortar a handful at a time, grinding and pounding with the garlic mixture. Add pinches of salt as needed. (The salt as grit helps dissolve the mint, but take care not to use too much.) 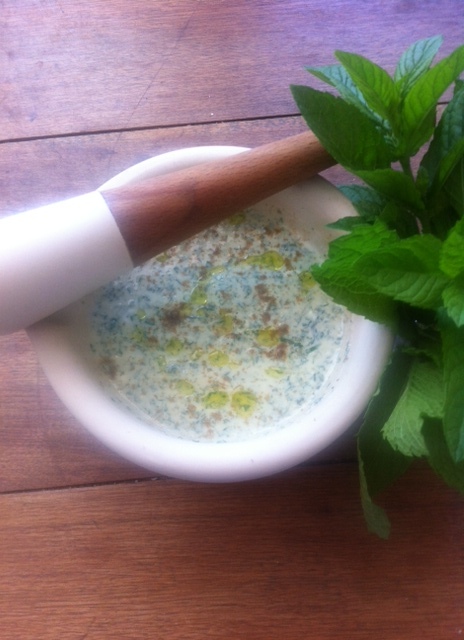 In a couple of minutes, the mass of mint leaves will have reduced to deep green mounded tablespoon of intense mint paste. Stir in the yogurt adding more or less to the desired minty-ness and check for salt. Top with a few drops olive oil and a light dusting of ground cumin. Serve with almost anything savory. Makes a scant cup; serves 2-4. Will keep 2-3 days in fridge though color may fade. You are currently browsing the Mary Jo's Kitchen blog archives for June, 2015.